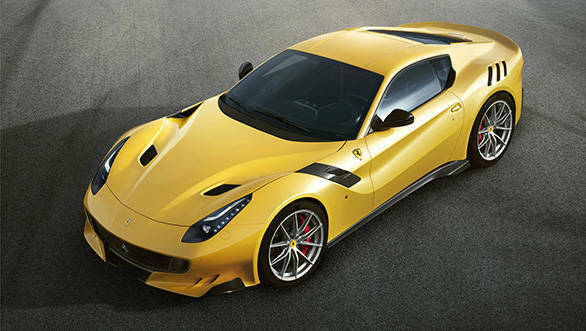 Ferrari has launched a new limited edition variant of the F12berlinetta in the UK. It's called the F12tdf  the tdf stands for the Tour de France, the legendary road race that was held annually in France between 1899 and 1986. The Ferrari F12tdf is a tribute to the 1956 250 GT Berlinetta that dominated the iconic event for four consecutive years in the 1950s and 60s. The Ferrari F12tdf gets the same 6262cc V12 as the F12berlinetta but it's been tweaked for a mental 780PS of maximum power output (up by 40PS). Torque is a formidable 705Nm at 6,750rpm  that's 15Nm more than the Berlinetta. Around 80 per cent of all this turning force is available right from 2,500rpm. The tweaks to the drive train include mechanical tappets borrowed from Ferrari's race car tech and variable-geometry intake trumpets usually seen in Formula 1 cars. Ferrari's racing pedigree is evident from the changes they've done to the car on the outside to keep it sleek and aerodynamically efficient. Ferrari says the new F12tdf's aerodynamic efficiency figure at 1.6 is double that of the F12berlinetta. 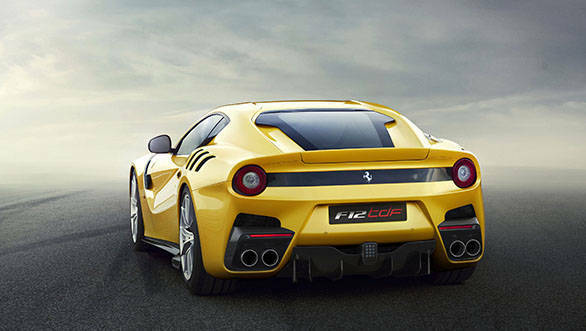 Also, the downforce generated by the F12tdf at 200kmph is 230kg which is a whopping 107kg more than the standard car. All of this is coupled with a weight saving of 110kg, thanks to extensive use of carbon fibre and aluminium both inside and outside. 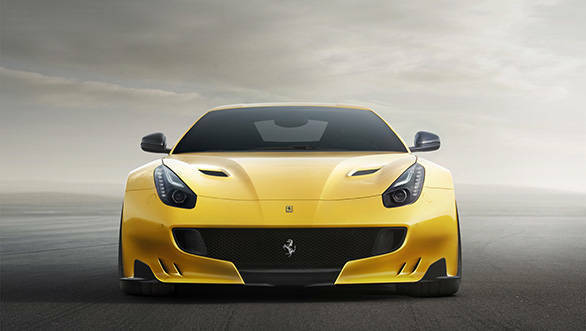 Ferrari has also increased the front and rear track of the car, making the car sit with an even more purposeful stance. 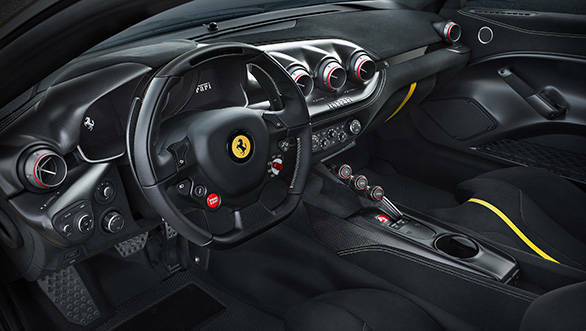 The interiors of the new F12tdf are stripped down to the bare essentials. The instrument pods are carbon fibre and the glove box is replaced by knee padding. Finally, all the luxurious leather trim in the F12berlinetta is replaced by Alcantra in the F12tdf. Ferrari has also used its vast technical expertise to make all that power and handling capabilities, more accessible to the less experienced drivers too. Firstly, it has increased the size of the front tyre, from a 255mm to 275mm and increased channel size from 9.5-inch to 10-inch. The company claims that this setup will provide higher lateral acceleration. To counter the effects of oversteer that's inherent in such setups, Ferrari has debuted what it calls the Virtual Short Wheelbase System in the F12tdf. What this means is that the rear axle is active and this allows the rear wheels to pivot around a vertical axis. In layman's terms, this means the rear axle steering automatically adjusts the wheels to improve the agility of the car. 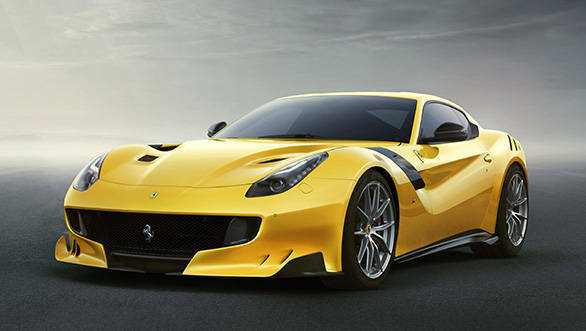 Ferrari has limited production of the F12tdf to 799 units only.